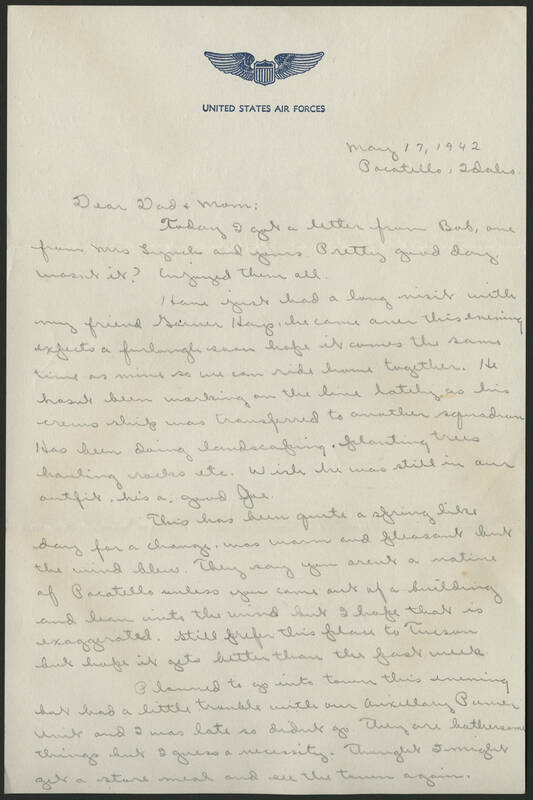 May 17, 1942 Pocatello, Idaho Dear Dad + Mom: Today I got a letter from Bob, one from Mrs Lynch and yours. Pretty good day, wasnt it? Enjoyed them all. Have just had a long visit with my friend Garner Hays, he came over this evening expects a furlough soon hope it comes the same time as mine so we can ride home together. He hasnt been working on the line lately so his crews ship was transferred to another squadron. Has been doing landscaping, planting trees hauling rocks etc. Wish he was still in our outfit, he's a good Joe. This has been quite a spring like day for a change, was warm and pleasant but the wind blew. They say you arent a native of Pocatello unless you come out of a building and lean into the wind but I hope that is exaggerated. Still prefer this place to Tucson but hope it gets better than the past week. Planned to go into town this evening but had a little trouble with our Auxillary Power Unit and I was late so didnt go. They are bothersome things but I guess a necessity. Thought I might get a store meal and see the town again.